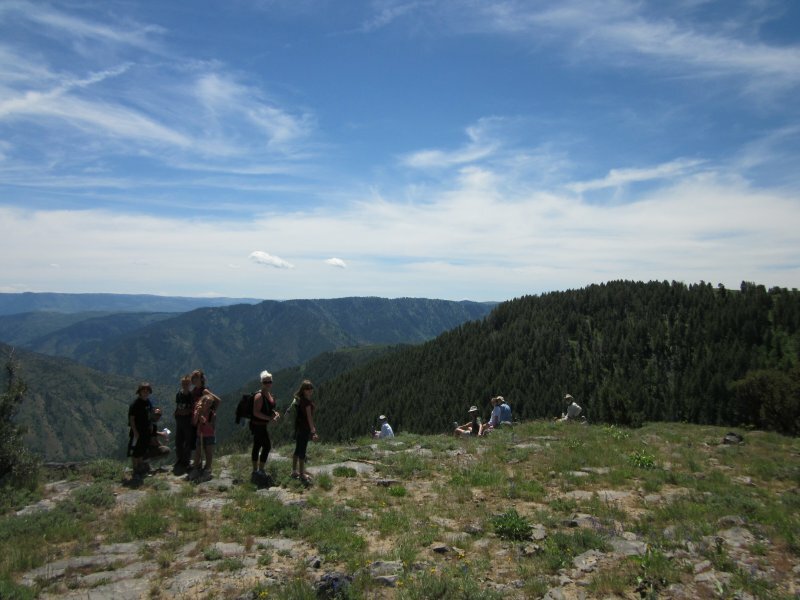 We had 20 people on this hike! Dave W, Dave P, Jane, Ron, Reinhard, Gary, Kathy, Barbara, Norma, Christine, Dan (the hike leader), Crystal, Justin, Chris and Jen with their 4 kids and friend. It was clear from the outset that some people would be slower, so we split up into two groups and kept in contact by radio. This was a pleasant hike for this unseasonably warm day - the hiking was easy and most of the trail was in the shade. 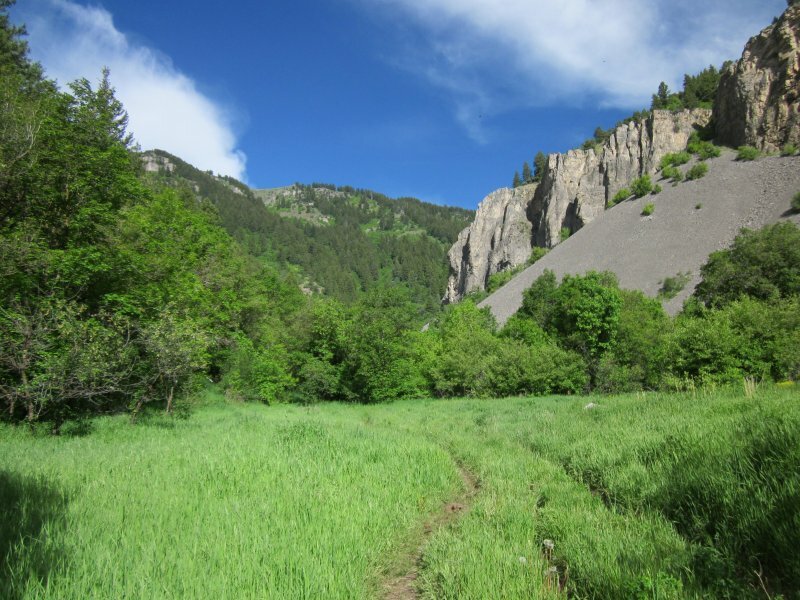 After about 1/2 mile of hiking we got to a meadow where we could see our destination near the head of Leatham Hollow. There was a sign marking the "Leatham Hollow Spring" at 1 1/3 miles, but there was not a trace of water to be seen. Dan and a couple of the faster hikers encountered a rattlesnake where the trail switches back to the south after the spring. The snake crawled off the trail and took refuge in the bushes, but Dan stayed to point it out to the others as they arrived. This was the first rattlesnake experience for the young hikers in the group. After 4 miles we reached the saddle where the jeep trail emerges from Millville Canyon to the west. We followed this trail another 1/2 mile to our lunch spot on top of a rocky outcrop with a great view of the valley below. The slower group stopped along the switchbacks, below, but we started back at the same time so everyone could arrive at the trailhead together. The total distance for this hike was 9 miles, with about 2200 feet of elevation gain. We saw many wildflowers, including purple violets, bluebells, larkspur, valerian, and baneberry along the shady trails. 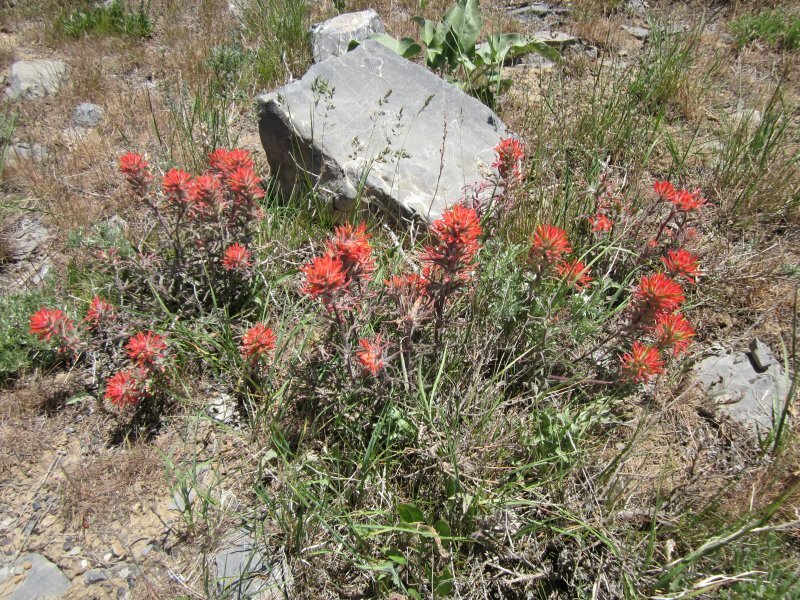 Indian paintbrush, penstemon and arrowleaf balsamroot were scattered around our sunny lunch spot. We all arrived back at Logan by 4:00. From this meadow you can see our destination in the distance. We enjoyed wildflowers and a great view from this lunch spot overlooking Leatham Hollow, below. Indian paintbrush at our lunch spot.